Transposition is the process by which two differing orders of play lead to the same position. In Go, this occurs relatively rarely, but there are some occasions on which it is possible, particularly in the opening. Of course, neither side is obliged to play this way (indeed, the Cho - O game rapidly went its own way). Here's one that could be missed. Answering the pincer with a slow play? This is a bit unexpected, because it seems to be a slow-moving shape. 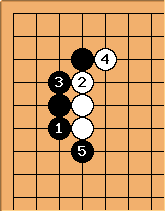 When White's approach is the marked stone, is joseki. Therefore the previous diagram can't be so bad for White. This isn't such a familiar sequence, perhaps; but that's because the pincer with has been out of style for many decades. The branching of variations of lines of play form structures that are called trees in mathematics (graph theory) and computer science, and increasingly in common parlance. When two branches grow together, the structure is called a Directed Acyclic Graph (DAG). The best SGF editors (such as CGoban2, gGo, etcetera) handle graphs very well, but do not handle DAGs at all. Confused: A DAG capable editor would bring you back to the main line (or another line) if a variation ends in a position that is already present in that line. This would be a cool feature to show, that both variations leads to the same end and the continuations from there are identical. The editor at GoProblems.com indicates merged branches. phenomene : Judging by the date of the creation of this page (6th december 2002), it should be the Meijin title match rather than the Kisei, and Cho Chikun's opponent was Yoda Norimoto. Cho lost the Kisei title to O Rissei in 2000, without playing this pattern.